This article ‘Breaking Bland’, by John Mahoney, is the most lucid, informative and interesting I’ve read on the whole MSG controversy. It goes into great detail about what exactly MSG is, how it is made, and how the human body interacts with glutamates. It’s quite magnificently ironic that just as chefs at the cutting edge of Western gastronomy are becoming fascinated by MSG and umami, the Chinese are waking up to the stigma that has been attached to it for forty years and losing their taste for it, if this article in the Economic Observer, ‘China loses its taste for MSG’, is to be believed! 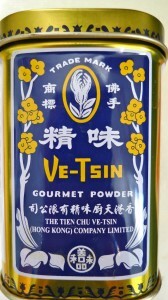 Even if Chinese people do request their food ‘without MSG’, it’s amazing how many chefs will continue to use so-called ‘chicken essence’ (ji jing 鸡精) anyway – and the cheap commercial ‘chicken essence’, which gives so many Chinese soups that intense umami taste and lurid yellow colour, has as its major ingredient MSG! (I already posted this on Buzzfeed, but want everyone to see it and feel my disgust.) I went through this entire article holding my breath awaiting reference to migraine disease. When I could no longer hold my breath, I did a search, the results of which yielded a few references but only among the comments. I know many people who agree with every word you have written, but none of them has been awakened at 3 AM by the Migraine Monster. Yes, I have kept extensive diaries: every migraine has appeared after ingesting something on your list of foods with the elusive ingredients. No, not MSG, I’m not stupid enough to consume that stuff, but the rest: Parmesan, tomatoes, mushrooms, your whole list. Write away, talk about MSG as GRAS, but give me your phone number, so I can call you at 3 AM and relieve my poor husband of the burden of living with a migraineur. No it isn’t. It isn’t ironic in the slightest. It might be surprising, controversial, interesting, illogical etc., but it sure as hell isn’t “ironic”. Look up “ironic” in a dictionary. It doesn’t mean “to my surprise”. Ruby – I refer you to the third definition of irony in the Collins English dictionary! you are probably suffering from histamine intolerance, looking into that may be worthwhile the effort. MSG has absolutely no effect on me. I love that even an article about food can raise people’s online ire nowadays! I too suffer from migraines, but not from MSG. Dried onions, artificial fruit flavoring, yes. Sometimes even spicy food! I did, however, get a nasty one from canned Chinese food that I was served years ago. It was the most awful tasting stuff anyway, so there is NO chance of a repeat of that! It’s hard to tell what gives people the ailments they have. But the science doesn’t support it MSG causing anything. At least not from what I’ve read. Plain and simple, I stay away from the things that give mean any ache or pain, unless I love the taste of it! If you believe MSG is not for you then stay away from it. It’s not necessary to get upset at someone for quoting what scientists have discovered. I would say though that I have a taste for things more in their natural, sweet state. I never use much salt or anything. Too each his/her own. MSG is evil! I have been in the chemical business for 30 years – long enough to know the S in MSG is from Sodium Hydroxide – Caustic Soda. It is an industrial raw material made by running electricity through salt, often in a cell filled with Mercury! If you want unami, eat more mushrooms – they are natural and loaded with glutamic acid. @Gary Price, the Castner-Kellner process (the one with the mercury) is not the only production process for NaOH and the NaOH from that process would never be used for food production. And after 30 years in the chemical business, you should know really know the basics of an ionic compound and the simple acid-base reaction. I bought a couple of the packets of different preserved vegetables last week that you refer to in your ‘mustard index’ post, and discover they’re stuffed full of MSG. Only your famous ya cai seems to be free of E621. The Sichuan chilli broadbean paste I bought is also full of it. Surely when you’ve fermented your broadbeans and then added a load of chilli you don’t need flavour enhancing. New Moon Loon on Gerrard St. was the source of the ya cai and the enhanced-flavour chilli paste. Is there anywhere in London that sells un-enhanced chilli paste? 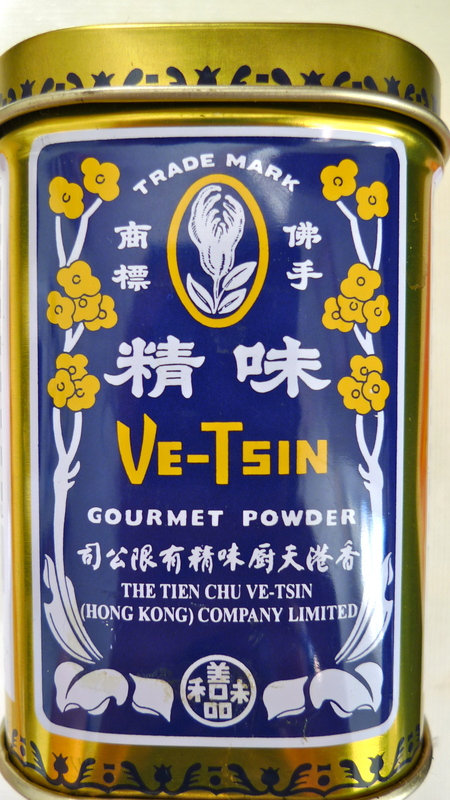 You will be hard pressed to find any Asian condiments – not just Chinese, but also Thai, Vietnamese, Japanese, Malaysian – that do not contain MSG, and as the EO article pointed out, it is common in all sorts of Western processed foods and snacks. It’s a shame that liberal use of MSG, cornstarch and bicarbonate of soda has become standard practice in much Chinese ‘cuisine’, and it’s encouraging that Chinese themselves are moving away from MSG. See Woo on Lisle Street sell the MSG-free Pixian paste – in the wicker tub containing two plastic pouches. Result! Having just discovered your blog, would like to say how much I am enjoying it. A little bothered by some people who leave you comments. They seem to be a rude, self obsessed smartarse’s. I am allergic to wheat but I do not send hate mail to Mr Kipling for saying how nice his bake well tarts are. Nor do I feel the need to correct his grammar. Very confusing but I did ask a shop assistant for Pixian chilli bean paste and he was adamant that it was the ‘soy bean paste’ I wanted, not the ‘hot’ one. Looking back at Fuchsia’s post about chilli bean paste, and her comment that the same Pixian company makes a ‘red oil’ version of the same product with MSG and other additives, it looks like I have the right thing… I think!